Sunday School ministries experience a significant attendance drop in Grades 4-6, with some students returning later for confirmation or youth ministry programs. Many curricula don't treat preteens differently, even though kids this age are going through puberty, developing abstract thinking skills, and spending more time with peers. We also saw a trend in churches starting tween-specific programs. What would it look like to design a curriculum with the particular needs of preteens in mind? That's what I set out to do for sparkhouse. 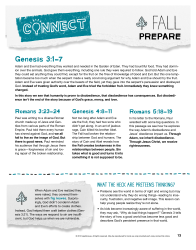 We identified four key audiences who would use this curriculum: preteens, children's ministry directors, preteen ministry directors, and youth ministers. A Bible overview for grades 5-6 that engages preteens in God's big story through videos, Bible exploration, and hands-on projects. 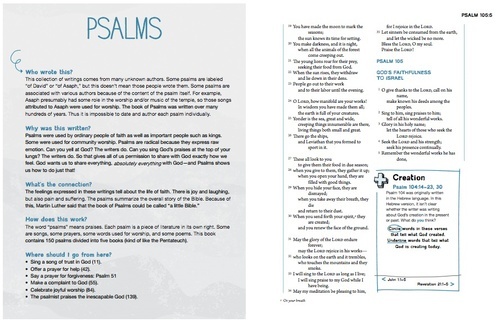 Spanning 10 units (with six lessons per unit), tweens journey through the Old and New Testaments and discover themes that run throughout Scripture. Every Connect lesson includes three sections: See, Explore, and Make. During each lesson, preteens discover a theme through watching a witty video, explore up to four biblical texts, and create projects that range from games to art and more. Connect was initially released by unit throughout 2012-2013. Now Connect may be purchased as a print product by unit, a la carte as individual downloadable lessons, or through a sparkhouse Online subscription site that also offers web-exclusive features such as Learner Sheet Tutorial Videos, preteen retreats, and film festivals. To spread the word about Connect, the team developed two overview videos. In addition to reviewing the scripts, another product designer and I served as on-screen talent to provide background on the product system. Posted on January 22, 2015 by Bethany Stolle. Copyright © 2015 Stolle Creative. Powered by Squarespace.